My final meal in Japan was Pizza from a pasta place in the Aoyama-Itchome subway station. I know, I know, pizza in Japan, especially as my last meal, isn’t very adventurous. When we got there, there it was full, and we sort of had a little trouble communicating with the hostess. But we were able to let her know we were willing to wait for a table to open up and she seated us pretty quickly afterward. ANYWAY, I wish I had known about this place before. There was so much on the menu I wanted to try. But I settled for pizza and a beer. The pizza itself was really good. My favorite part of it had to be the sauce, which I felt was very rich. Had I known it was a thin crust (as Vida put it: “paper thin”), I would have gotten a larger size. Regardless, it was good. Dessert was just as good. 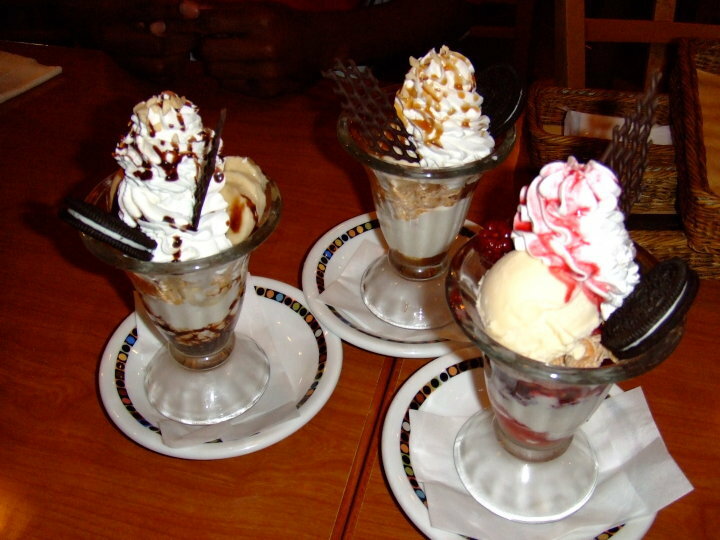 The restaurant had three flavors of parfaits: Chocolate Banana, Strawberry, and Caramel. So Vida, Bryce, and I all chose different flavors. Everything was well worth it and I’m glad I was able to enjoy my last meal in Japan. Couldn’t have picked a better place.